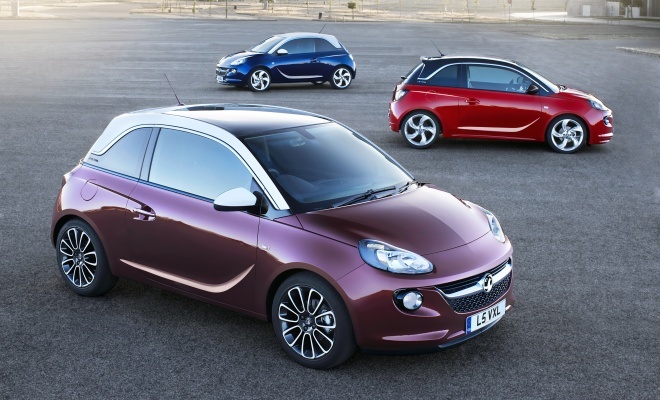 Vauxhall’s candidate for the premium supermini sector was finally revealed this week, in the shape of the new Adam hatchback. This is a car that will have to compete with the likes of the Fiat 500, Citroen DS3, Alfa Mito, Audi A1 and Mini hatch. At 3.7 metres in length it will certainly land in the middle of this competitive pack. The Adam is longer than the Fiat, shorter than the DS3, Alfa and A1, and pretty much on a par with the Mini that defined the sector. Mini was of course the first to make the case for upmarket downsizing, while also providing new-car options for the kind of buyers who might previously have shopped for larger, nearly-new second hand cars from premium makers. 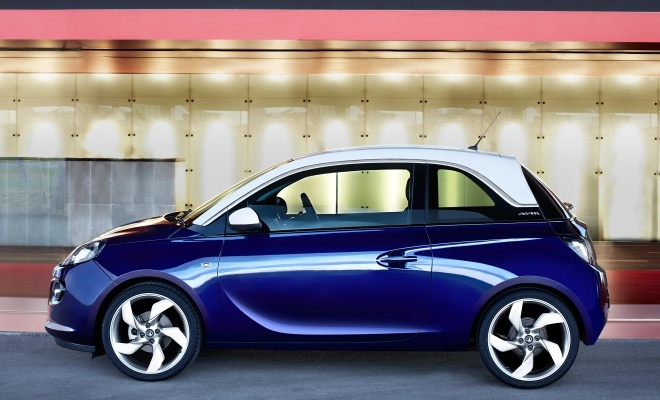 Vauxhall’s stylists have clearly borrowed a trick or three from the current compact contenders. Like the Mini and DS3 the Adam features a “floating” roof, painted in a contrasting shade and visually separated from the lower body by glazing and black plastic. The new car has the same kind of cheeky face as the Mini and Fiat, and some of the muscular surfacing of the Audi and Alfa. The swooping creases in the side are of course a Vauxhall signature, a condensed version of those seen on the Astra GTC three-door. The Adam reminds me a little of the Ford Ka from the rear, which is probably not a resemblance that Vauxhall was aiming for. And to my eye the Adam’s curvaceous roof is a less successful feature than the flat-cap approach of the Mini or Citroen. As a whole the roof calls to mind a baby’s bonnet, while the chromed S-shaped kink at the base of the rear pillar is reminiscent of the fake laundau irons that adorned vinyl-roofed Cadillacs in the 1970s. Not so attractive. 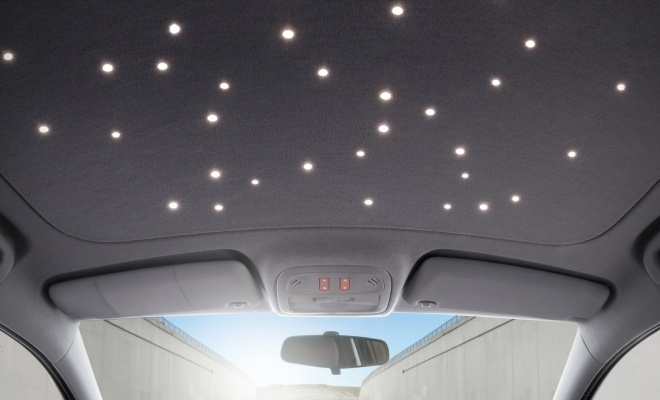 Slightly classier inspiration can be found inside, where one option is a black roof lining speckled with LED stars – a similar novelty is currently available in the Rolls-Royce Phantom. In common with rivals like the Fiat, Vauxhall has brought body-colour paint into the interior. It has also juxtaposed modern and retro technology – with the centre console’s seven-inch, touch-sensitive screen paired with deeply cowled clocks in the instrument cluster. Initially the Adam will come with a choice of three petrol engines: a 69bhp 1.2-litre four-cylinder unit or a larger 1.4-litre offering either 86bhp or 99bhp. 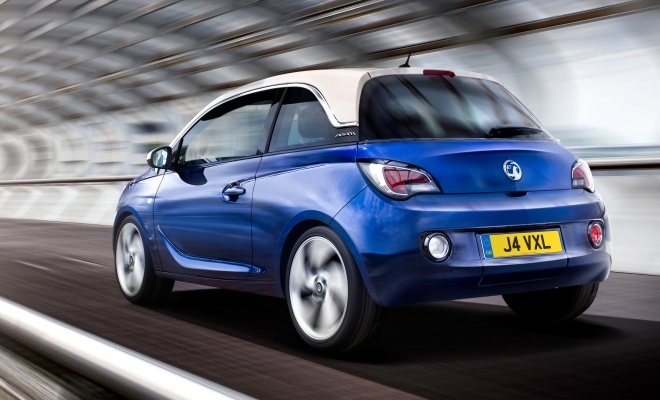 All will offer stop-start as an option and will be paired with a five-speed manual gearbox. A six-speed box and a new high-output, small displacement engine will come on stream after the car’s introduction. The first UK Adams will reach customers in January 2013. Three trim levels will be offered, unwisely dubbed Jam (described as colourful but no doubt the base spec), Glam (with a luxury bias) and Slam (with sporty leanings). Wham, Bam and Thank You Ma’am were presumably also on the whiteboard when that particular trio was dreamt up. There will be an extensive palette of paints on offer, plus two roof colour options, and enough customisation options to make no two Adams alike, given enough customers with sufficiently poor taste. Pricing remains to be revealed – we can expect details at the Paris Motor Show in September. I imagine the Adam will be priced on a par with the Fiat 500.